First, you will need to submit our Adoption Application for our review. You will be contacted within 48 hours of our receipt of your application and we will arrange for a phone conversation to discuss your lifestyle and needs and to arrange for an in-home visit, if needed. 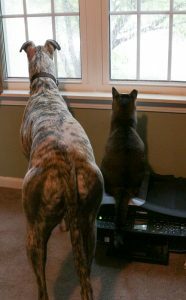 An in-home visit is typically for a first-time adopter and it is a good opportunity to meet each other, ask more questions and for you to see just what it is like to actually have a greyhound in your home. MGCR does reserve the right to refuse any applicant, so please understand that it is within our discretion to make those decisions on behalf of our greyhounds. Once your application is approved, we go to work to match you with a greyhound whose personality and temperament will best suit your family’s lifestyle. Approved applicants are matched based on best fit for family and greyhound not on a first come first serve basis. The greyhound’s foster family will arrange for you to meet and spend some time with your potential new family member. You will need to bring the entire family as well as any other dogs that you may have to this visit. It is easy to fall in love at first sight and you may want to run off with your greyhound right then and there, but you should take a day or two to think about this particular dog. We will want to hear how the visit went from both you as well as the foster family. Be sure to discuss with us any questions or concerns you may have. We want each adoption to be lasting and it is important for you to be sure about your feelings. Assuming that all are in agreement, an adoption coordinator will meet with you to complete the adoption. There will be a contract for you to sign and we will collect the adoption fee. For US dogs, the adoption fee is $275.00 or $150.00 for dogs age eight and older. The adoption fee for greyhounds received from China and for the Spanish galgos/podencos is $625.00 and $250.00 for dogs age eight and older. Our relationship with you does not end there, however. You are a part of the MCGR family and you will receive ongoing support from our follow-up team to answer questions and discuss any challenges you might experience as your greyhound transitions into his new home. Please keep in mind that we depend 100% on volunteers, many of whom have full-time jobs, so we ask for your understanding as we do the best we can in the endless effort to find homes for these deserving greyhounds.